Almost 600 years have passed by, what took place in Geneva during Calvin’s time has greatly impacted Switzerland, Europe and the rest of the world till today. Geneva became a legendary city where God once touched and shaped, a city that embraces the nations and for the nations to learn from. 6th Nov 7:00pm, with UofN students and staff from YWAM Burtigny, YWAM Biarritz and YWAM Grimerud as well as local Christians and pastors, we started our first celebration event at La Rive Droite church which located in the downtown of Geneva city. The opening worship was led by local Christians, both in French and English. 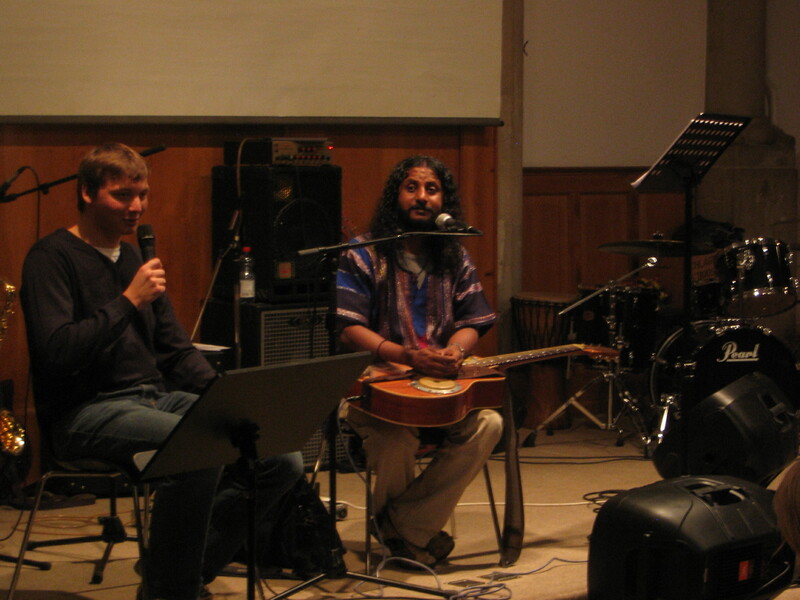 Then Benny Prasad, the most traveled Indian musician and YWAMer shared his powerful testimony and performance. The following message giving by Edwin Fillies was about reconciliation and deep connections with God and the body of Christ. After the message, many people were engaging in responding to God asking for healing and releasing forgiveness… After the sobering came the joy! The event ended with calling out different nationalities to dance before the Lord and everyone, which became many people’s highlight of that night. 8th evening, at another church in Geneva, Church for the Nations, we had the second N2N celebration! Daniel Appa shared a message of living out a radical obedience to God after Benny Prasad’s performance and testimony. He challenged the audience by asking why so few Christians have stories like Benny’s. Then he kept elaborating that the radical obedience to God is the key to live an extraordinary life, also is the greatest adventure known to mankind. After his message, many young people came to the front asking for prayer, repenting and committing themselves to the radical obedience lifestyle. For two afternoons (8th and 9th), YWAM teams and local churches had outreaches together in the city! One afternoon, one team prepared balloons and flowers with scriptures tied on them, and gave them out with smiles to strangers walking on the streets in a light rain. Many people were very friendly and gladly received the blessing. Another team waited on God for specific location and people to share Jesus with. Afterwards they drew what they got from God on a piece of paper and ended up talking to the exact attributes of the people at the exact location which God revealed to them! When asked why chose them to talk to, this team showed them the piece of paper and explained how God loved them and He can reveal Himself to people! They had a great time sharing about this living God. The following afternoon was sunny and beautiful. With the pastor of Eglise Evangelique Apostolic church, some of us went to an international community. Benny Prasad and a French rap team from YWAM Nyon performed for the kids there. The rest went out into the streets for evangelism. Some teams prepared free coffee, tea and hot chocolate for people and it’s a great way to start conversations. One team were holding “free hug” signs standing in front of a shopping mall. Many came to receive hugs. When asked why doing it, they got to share with them about God’s love! How fitting it is to celebrate the nations in the city of the nations! After the wonderful week of N2N Celebration Geneva, we are expecting greater things to take place in the city in the near future! Thank God for realizing the N2N Geneva dream! We are continually dreaming with God for many other cities in the world to bring N2N celebration there.